Though not as famous as the country’s north, Vietnam’s central region offers some wonderful treks, allowing you to spend days walking through dense rainforests, spotting spectacular wildlife and enjoying amazing landscapes. Trekking is also a chance to test your powers. The following four treks, compiled by Timeout Vietnam magazine, are highly recommended. It takes around three days to trek the 60 km Ta Nang-Phan Dung route. 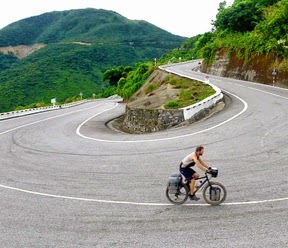 It takes you through Lam Dong, Ninh Thuan and Binh Thuan provinces and to an altitude of 1,100 meters above sea level. Starting at Ta Nang Commune in Lam Dong Province and ending at Phan Dung Commune in Binh Thuan Province, trekkers will walk through forests, wade across streams and cross mountain passes. The landscapes are amazing with endless green hills and dense forests. This is a trek not to be missed. Around 50 kilometers from the resort town of Da Lat, the Bidoup-Nui Ba National Park is located in Lam Dong Province’s Lac Duong and Dam Rong districts. The trek will take you through the most beautiful landscapes in the Central Highlands with hills covered in pine trees and waterfalls. It is also a challenge to climb up Bidoup (2,287m), the highest peak in the Langbiang Plateau. Trekkers will have the chance to see dense pine and bamboo forests and paths shrouded in clouds, hear the sounds of birds and monkeys and enjoy good local foods. Hon Ba Nature Reserve, a popular tourist attraction atop a mountain some 60 km east of Nha Trang, is good for adventure trekking. Soaring 1,578 meters above the coastal plains of Khanh Hoa Province, Hon Ba is indeed a challenge to trekkers as the paths to the top of the mountain are slope and wind like moving snakes. With its diverse flora and fauna, Hon Ba is an ideal place for those who want to learn about nature. Trekkers will have the chance to see some endangered species there. Located in Ninh Hai District, Ninh Thuan Province, the Chua (God) mountain range, comprising of a tall peak and three lower ones around it, is often ignored because trekkers think it is too simple and has nothing special to offer. But once you reach the top of the mountains, you will realize how challenging it is. It is like walking in a desert with the scorching sun above your head and hot sand under your feet (Ninh Thuan has the highest number of hours of sunlight of any province in Vietnam and is the driest province in terms of rainfall). At the foot of the mountain, you will find it easy walking through cogon grass fields. But as you climb higher, the roads get steep and rocky. Though the mountains are not too high (the highest peak being 1,040 m), you will walk from one mountain to another, making the paths appear endless. You will be rewarded with amazing landscapes, with streams flowing through rocky creeks, beautiful flowers and herds of goats grazing leisurely. When you feel the cool breeze, watch the beautiful coastline beneath the mountains and the deep blue color of Vinh Hy Bay, enjoy a meal under the trees while watching the sun go down the mountains, you will think the trek is worth it.